Burgi - ქალის თეთღი საათი ბრილიანტის მარკერით და სვაროვსკის თვლებით. იაპონური კვარცის მექანიზმი ტყავის სამაჯურით. WOMEN’S DESIGNER WATCH: Burgi combines function with fashion to create a beautifully designed timepiece that never goes unnoticed with quality craftsmanship and luxe details. 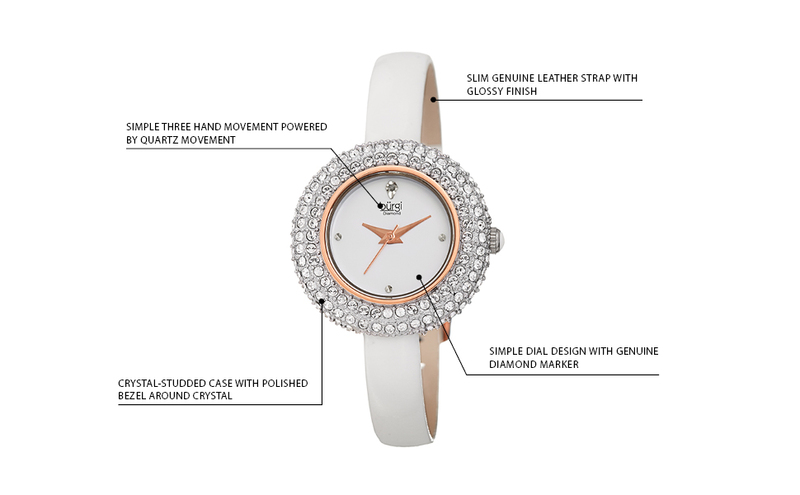 EXQUISITE DESIGN: Glimmering Swarovski Crystals detail the bezel and make up the markers to create a shimmering look. A polished finish alloy case perfectly complements the smooth leather strap to create a dazzling, elegant fashion statement. ELEGANT & DURABLE: Made from premium quality materials and designed with 3 ATM (30 meters/100 feet) of water resistance. The round case and bezel is backed by a Stainless steel case back ensures maximum protection for the sensitive movement. BEAUTIFUL CRYSTALS: The bezel features crystals, Unlike most other watches, this watch is guranteed to be an attention grabber. The elegant yet casual watch supports a beautiful crystal encrusted case with a polished finish. ELEGANT GIFT BOX: A beautiful gift box with an interior plush cushion provides a delicate display perfect for a Mother's day, anniversary or birthday present for the woman in your life. Burgi watches are backed with a MONEY BACK SATISFACTION GUARANTEE. Crafted from the finest materials and inspired by the modern fashion industry, this Burgi timepiece displays an incredible presence of prestige and luxury. The entire case is studded with Swarovski crystals in seamless clusters, leaving a sliver of a bezel to affix the protective crystal lens. The delicately crafted dial is adorned with hand-applied markers, including a single genuine diamond at the 12 o'clock position. Inside, a highly advanced quartz movement ensures top notch accuracy and reliability in its classic three-hand timekeeping. Color-coordinated to match, this watch is accented with a black enamel cabochon on the ground and outfitted with a glossy genuine leather strap. The delicate features of this timepiece are set front and center! Each of the sparkling Swarovski crystals is hand-applied to the case to ensure precision placement and optimal shine.